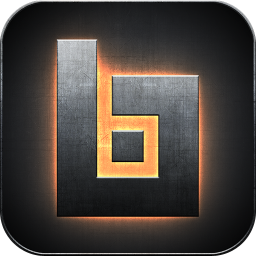 Based in the distant future, Blastpoints is all about frenetic, fast-paced action as you pilot a spacecraft in a enemy-filled space arena. 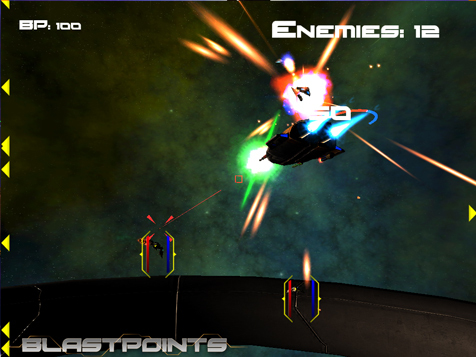 You begin with a rather basic spacecraft equipped with basic lasers and missiles and are able to select one of several of the arenas in addition to the level of difficulty : most arenas involve maneouvring around a large space station or space obstacle (like the level called "Pipe" which is a just large pipe floating in space) whilst enemies swarm around trying to make spacejunk out of you. Destroying enemy spacecraft and completing objectives earns Blastpoints, that can be used in the Garage to upgrade your primary and secondary weapons, your spacecraft and attain some use-once items. Objectives are limited and not particularly varied with the majority of objectives involving destroying some or all of the enemy spacecraft or surviving a level, all within a certain amount of time. Although the background story is non-existent, space combat is what makes this game. Space combat does look good but the detail on the enemy ships and the space stations are a little lack lustre in my opinion. 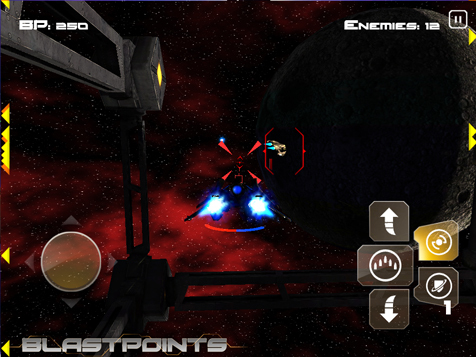 Blastpoints does make up for this with the speed at which everything moves, making it a rather thrilling experience. The controls aren't particularly responsive and this does mar an otherwise decent pick-up-and-play game. The music for the whole game is particularly well-done, interspersed with ear-catching, futuristic tunes. Perusing through the Garage does pique my curiosity but looking at the prices of even the most basic items sends it plunging again. Having completed missions on the highest difficulty, I have a rough idea of how long it will take to attain some of these items, and even on the highest difficulty (and thus the highest Blastpoints multiplier), most items will require a high level of grinding. This is unfortunate, as the weapons and ships available vary enough to allow you to modify your strategy going into the different arenas and make things interesting, so it is a shame that they require so much grinding. That is if you do not want to use your hard earned cash. Also, the game boasts over 15 million different combinations of weapons, but this kinda looks like a mathematical combination of the limited number of primary, secondary and special weapons that you can equip on the limited number of ships available. 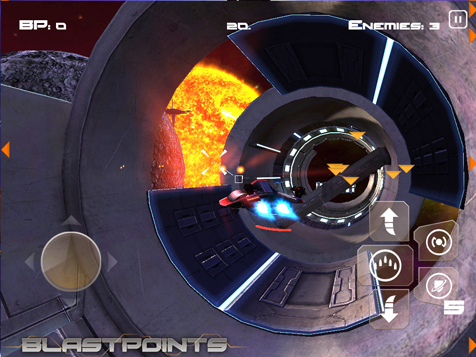 Blastpoints does make a decent attempt in the space-genre, let down slightly by unresponsive, clunky controls and an overly-expensive, IAP-encouraging shop. Not having a backstory limits the longevity especially with games like Galaxy On Fire 2 out there. This does make Blastpoints difficult to recommend for the long term, but at its current cheap price, Blastpoints is an adequate fit for the the pick-up-and-play casual play session, at least.